Samsung will at the end of this month launch a new series of Galaxy M handsets in India, but it seems there is more to come from the company now that the year is just getting started. 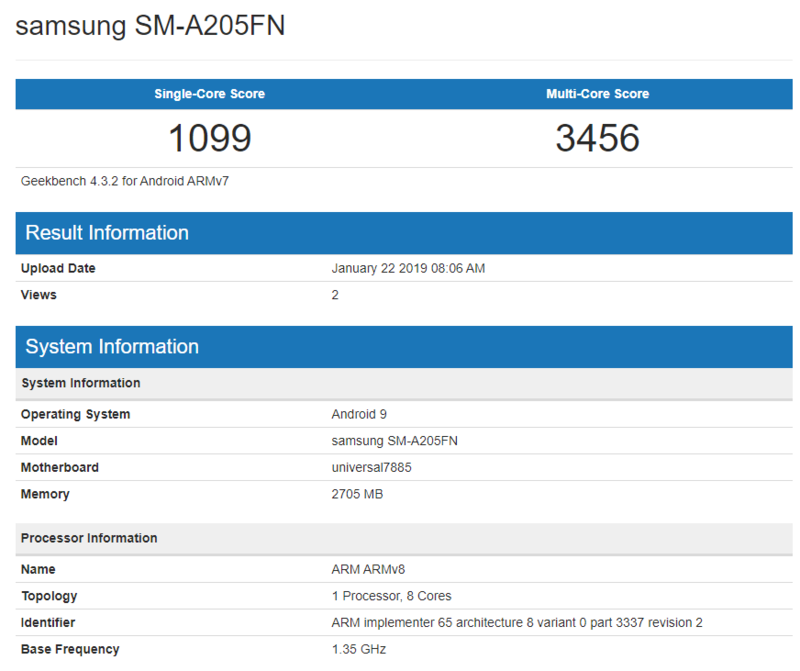 An unknown Samsung device with model number SM-A205FN has been spotted on Geekbench. At the moment, no details are out there regarding the possible name of this phone, but we are likely looking at a certain Galaxy A20 or Galaxy A2 for that matter. In terms of specs, the phone is seen powered by an Exynos 7885 chipset allied to 3GB of RAM. The processor is an octa-core unit clocked at 1.35GHz and in fact, it’s the same unit expected in the likes of Galaxy M20 and Galaxy M30 but with different clock speeds. For the software, Android 9 Pie is on board, suggesting that the Galaxy A20 will be unveiled after the launch of the Galaxy S10. Given that One UI is now the new Samsung custom overlay, we expect it to power the A20 out of the box. Now that we know there is a Galaxy A20 in the works, we should get more details about it in the build-up to its launch, probably in Q2 2019.